Little David is naughty...hilariously so! Each double-page spread is devoted to a different unruly deed by the little stinker, plus a speech bubble plea from his mom to stop. But, to balance the shenanigans and misbehavior, Shannon ends the book on a positive note, with David getting a hug from his mother and reassurance that despite his misdeads, "Yes, David, I love you." No, David! is one of the most memorable books we have run across in years. 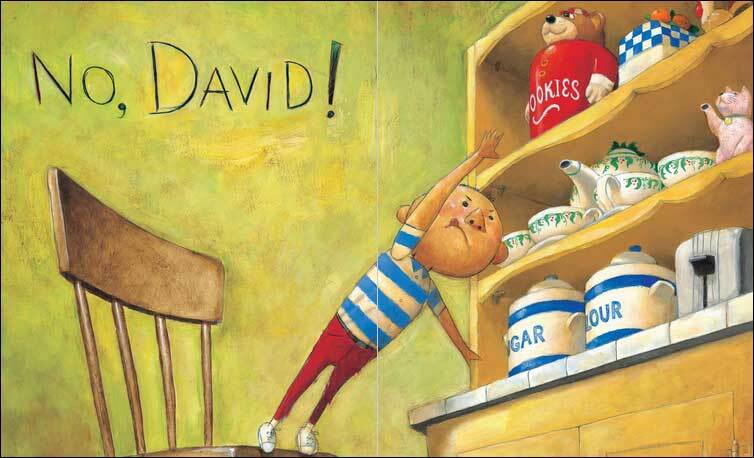 It's such an honest, hilarious look at childhood misadventures and little David is so full of energy, always into something new, often with messy, noisy, or disruptive consequences. 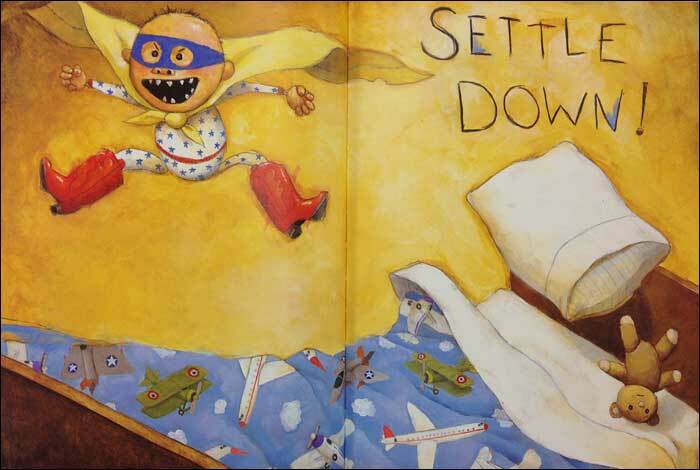 Instead of a plot, what takes center stage are the hilarious illustrations, which each one telling a story! Children will secretly recognize a bit of themselves in this book. 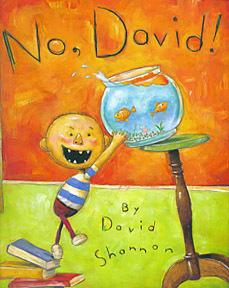 And don't worry...children don't seem to take away from this book a desire to mimic David's wild shenanigans. Instead, it provides a nice reminder to children that they are loved despite their mistakes. Be sure to tell your kids that the author wrote this book about his own childhood! Reading Levels for No, David! Here are some sample pages from inside this book. These sample pages show the highly saturated illustrations and the minimal text. 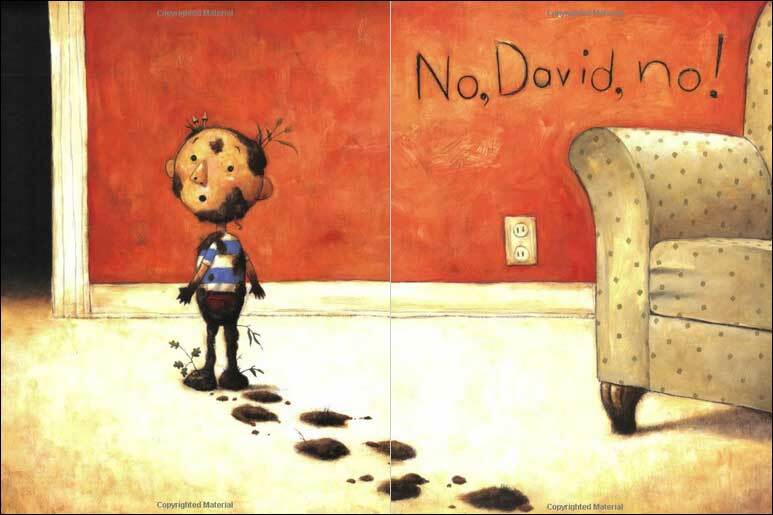 The emphasis is definitely on the funny, almost child-like illustrations and little David's rambunctious personality, which really shines through. We highly recommend this book!!!! This fun book has struck a cord in so many readers that David Shannon has written a number of follow-up books, all featuring little David and his antics. David Goes to School is a great book to read at the beginning of the school year when you are introducing classroom rules. David's bad example of funny but highly disruptive behavior will actually demonstrate to your students why they do indeed WANT classroom rules. And It's Christmas David! is, of course, a fun and different picture book to read at Christmas time. 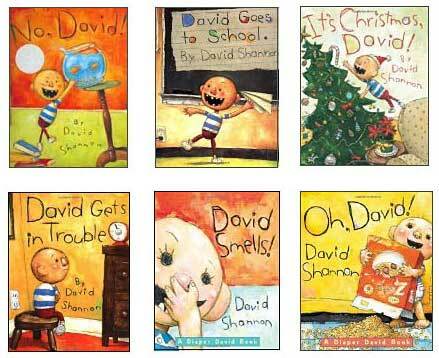 Your students/ children will certainly relate to David's over the top energy and excitement about the holiday!